L. Scott Frantz, a Greenwich native grew up on the Long Island Sound. He is a lifelong boater and an avid pilot. He is a family man, politician, public official and businessman. Senator Frantz currently serves as a member of the Connecticut State Senate representing the 36th Senate District. Now in his 5th term, Frantz also serves as Deputy Senate Republican Majority Leader and on several committees, Co-Chair of the Finance, Revenue and Bonding Committee, and the Commerce Committee and Vice-Chair of the Government Administration and Elections Committee. 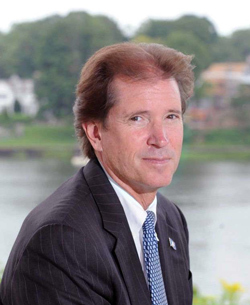 Senator Frantz has also served as chairman of the Connecticut Development Authority and the Board of Directors of Bradley International Airport, where he also served as chair. The Senator gives generously of his time by serving on a number of public and nonprofit boards, including the Greenwich Teen Center and Corporate Angel Network. Senator Frantz is president and chairman of Haebler Capital, a private investment firm in Greenwich. He attended The Hotchkiss School, Princeton University and Dartmouth’s Tuck School of Business. Senator Frantz lives with his wife and four children in Riverside.